In ancient Britannia, the warrior who brought down the king stag was named the defender of the land. Eartha’s brother Balen has been in love with Princess Galiene since they were children. Upon the death of the High King, the tribesmen of the realm vie for the throne, and with it, the hand of the fair princess. Balen is desperate to win his lady, but a rival tribesman is equally determined to keep them apart. With her brother, her dearest friend, and the country she loves all hanging in the balance, Eartha must do the unthinkable to ensure her brother’s victory in the stag hunt. Sometimes true love needs a helping hand…or some blood to be spilled. 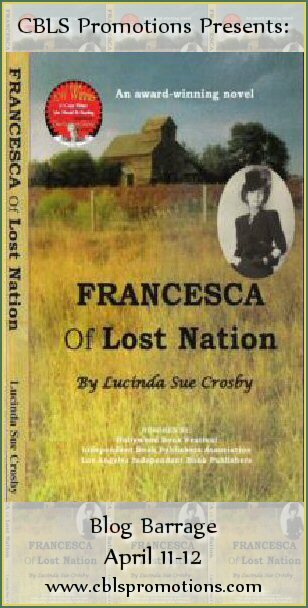 Giveaway Info: Prize is 10 eBook copies of “Francesca of Lost Nation”. Contest is tour-wide and ends Apr 17. Must be 18 years of age or older to enter. Rafflecopter and tour schedule links are at the bottom of the post. Good luck! Winner of Four Literary Prizes / Author selected as one of “50 Authors You Should be Reading” by The Authors Show online media outlet. Romantic Adventure Book suitable for all ages! This book is about an unconventional 59-year old woman, Francesca, and her resourceful 10-year old granddaughter, Sarah, who share the adventures of a lifetime over the summer of 1947 in Lost Nation, Iowa. Together, they enchant barnstorming pilots, wow Clinton County Fair attendees, conquer the skies, confront an escaped arsonist, discover how Lost Nation got its intriguing name, and eventually demonstrate to one another the greatest truth about love. Anyone who loves their grandmother will enjoy reading this Romance Fiction about family, friendship and strong women. Lucinda Sue Crosby is Kindle Bestseller and 2011 Winner by TheAuthorShow of “50 Authors You Should be Reading.” In addition, Crosby is a Nashville songwriter, commissioned poet, award-winning journalist and prize-winning author. Her novel, Francesca of Lost Nation, has been on the Kindle International Bestsellers list in Romance categories and has won four literary prizes.